KEY FEATURES: Tree to 12m. LEAVES compound, evenly-pinnate, to 30cm; LEAFLETS 10-30 pairs, to 5x1.5cm. FLOWERS hanging clusters of 2-4, white or red, pea-like, to 10cm long; winter flowering. FRUIT very long, slender pod, to 50x1cm. 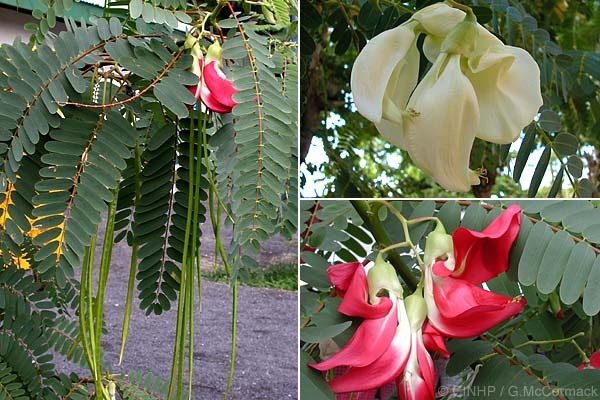 SIMILAR SPECIES: Sesbania coccinea, a native Societies to Henderson, has leaflets fewer, to 13 pairs (vs to 25pairs), petals 2-3cm (vs 5-10cm), petal colour pink-yelow with red-brown stripes (vs red or white), and fruit to 20cm long (vs to 60cm). Rarotonga: at Jimco, Avarua, field-ID, GM 7/2000 - imported by Tony McBride in 1999 as seeds from Fiji.